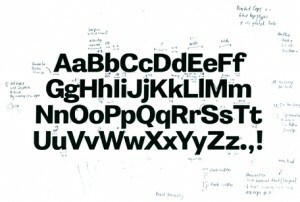 It comes as a surprise to many people that new typefaces are being produced all the time. Even more of a surprise is that this is happening in Australia, a place seemingly a world away from the traditional centres of typeface design: Europe and the US. There is something very familiar and comfortable about Jones. Perhaps it is the current resurgence of classic English grotesques or maybe the ever-present desire of designers to represent modernity through a sans. Following the market success of Kris Sowersby’s National and Founders Grotesk, we may see more faces akin to Jones in the near future. As an academic project, the sheer effort and commitment of Chan to develop Jones is to be truly commended. With some further refinements and completion of the yawning gaps in the family of weights, we can look forward to seeing Jones, and perhaps more design output from Chan, contribute to the exciting and emerging field of Australian type design. Stephen Banham: Let’s start with an important question – why does Jones exist? 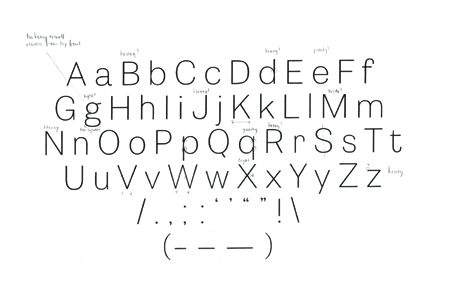 Vincent Chan: When I was writing my honours proposal in late 2009, I had outlined a brief for a magazine text face allowing me to tackle optical sizes, styles and weights – a broad array of typographic problems that the hierarchy of a magazine would warrant. Around this time, a fellow student was doing an internship with Stuart Geddes. One of the projects to come up was the redesign of an identity system for the artist-run initiative West Space. Stuart was keen to design a custom face and my name was put forward as someone interested in helping out. After much discussion, I decided that this brief could form the basis of my honours project. SB: What inspired its design? VC: First, we looked at the choice of typefaces already used in West Space collateral. Stuart had been using Parry Grotesque for body copy and Reader Black. What resulted was a particular interest in channelling an avant-garde spirit and naivety of form by referencing early British grotesques. Rather than going down the geometric, European avant-garde route, we looked to the first clumsy grots of foundries such as Stephenson Blake and Edmund Fry. Eventually I let go of these models and began to trust my instincts more. The two other main references were Eric Olsen’s Maple and David Berlow’s Bureau Grot(esque). SB: What do you ultimately intend to do with Jones? VC: Jones is my first proper foray into type design and I know it is probably riddled with flaws. It is fairly incomplete as it stands (only a display extra bold, display ultra-light and text regular exist). An italic would be nice. SB: What particular problems did you experience and how did you overcome them? VC: Initially the biggest issue for me was learning Fontlab. Apart from the technical issues, I struggled with what letterforms should look like. In time, however, after speaking to a few type designers and graphic designers, I began to trust my own inclinations and tried not to be so hung up on the ‘right’ way to draw. SB: What inspired the name Jones? VC: The founders of West Space are Brett and Sarah Jones (Stubbs). Also ‘Jones’ seemed to have a certain friendly, perhaps even Australian, feeling. 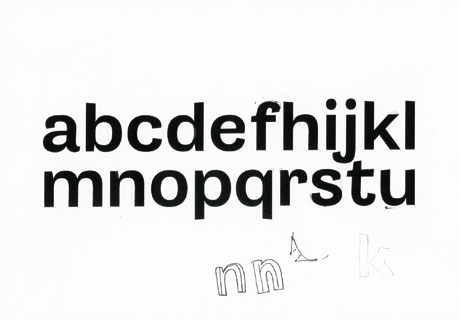 It also shows off the buoyant hooks in the letters J and s.
Stephen Banham is founder of Letterbox. Living languages: Can you read in Tree? Really lovely, nice to see some Australian type design going on.